Upstate Medical University has been re-surveyed by the Accreditation Council for Continuing Medical Education (ACCME) and awarded accreditation with commendation for 6 years, through November 2019, as a provider of continuing medical education for physicians. 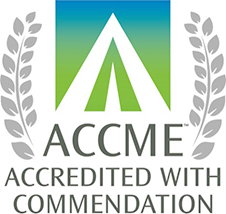 ACCME accreditation seeks to assure the medical community and the public that Upstate Medical University provides physicians with relevant, effective, practice-based continuing medical education that that supports US health care quality improvement. Last Modified: December 27, 2017. Contact Anne Beaudin with questions about the content of this page.